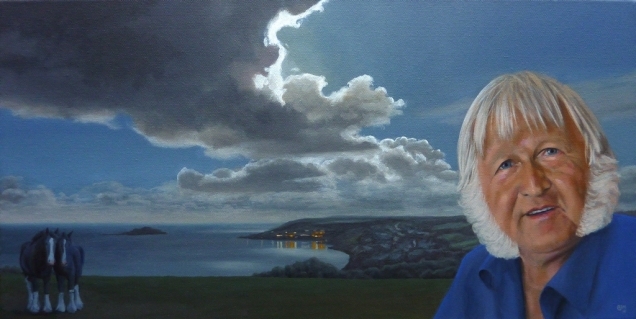 Portrait of Mike Elford of Cornwall, with the moonlit view from his home, featuring Looe Island, the lights of West Looe and Hannafore in the background, and his beloved shire horses looking on. This was a commission, painted in 2010. If you wish to commission a painting, a portrait, a landscape, or a combination of the two, please don't hesitate to contact me so we can discuss what may be done. 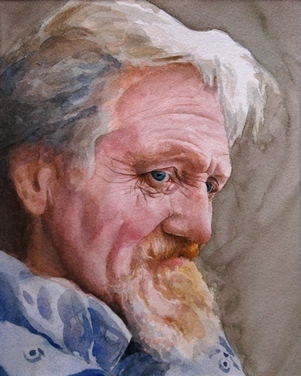 If you have not already looked through the images of portraits in my online gallery, you might like to click here. 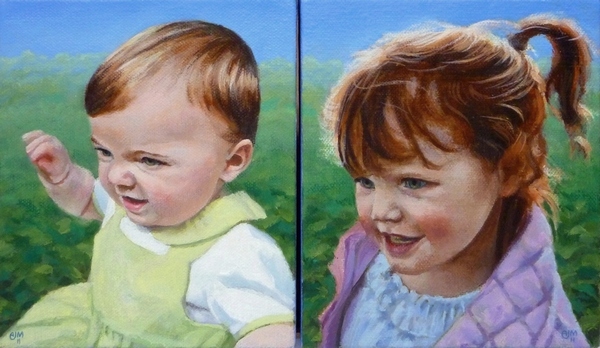 'Lulu and Ella' oil on canvas, each 5" x 6"
"The portraits arrived today and they are stunning! I thought they were fantastic over email, but in the flesh they are even more lovely (which I did't think possible!). Thank you so very much. Ella looked at her portrait and said 'WOW Mummy, that's me!'. Lulu started flapping her arms around which is her sign of high approval. Thank you also for taking such great care in wrapping and sending them. They arrived completely intact and in great shape (even though the box looked like it took a bit of a beating)." These kind words were from the mother of the two girls I painted recently. and were shipped to America on completion. Long periods of posing are not necessary. I can work from a client's own photos, though I do prefer to take the photographs myself wherever possible. I can then inform the portrait with my own response to the individual, resulting in an image that could not be arrived at in any other way. I like to capture an expression or even a movement that would be so fleeting that working from life couldn't catch it. This is especially true where children are concerned. "In his incredible 'photo-realistic' artistic style, Alan did the most extraordinary painting of my father many years ago. When we wanted one of my mother to sit alongside it, he was the only person we would have trusted to do it. The task couldn't have been in safer hands. 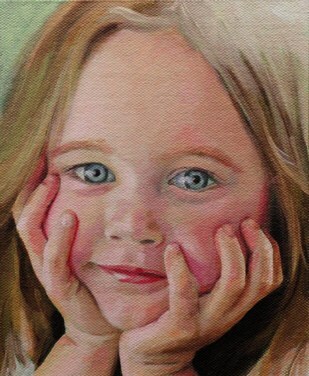 I don't believe any painter could have captured her the way he did. Thanks to Alan's skill we're now reminded of them both dozens of times every day." There are any number of sizes, mediums, supports, and formats that may be appropriate for your requirements. These result in a very wide range of prices, but it is possible to give a rough guide so you might have an idea of what to expect. Terms:- half in advance, half on completion. Delivery/shipping and framing to be arranged extra.